This Out of Box Thinking Maths Brain Teaser was given to me by one of higher class student during my visit to my kid's school. After a deep and out of box thinking, I could solve this tricky Maths Puzzle. 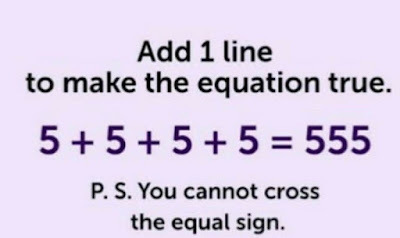 Lets see if you can solve this Out of Box Thinking Maths Brain Teaser? Can you solve this Tricky Maths Puzzle? Answer of this "Out of Box Thinking Maths Brain Teaser for students", can be viewed by clicking on button. Please do give your best try before looking at the answer. 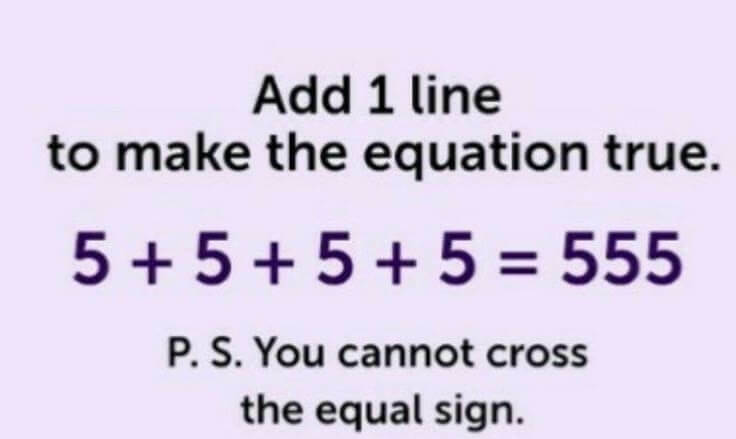 Add one line to made center most + sign 4 and now equation reads 5+545+5 which is equal to 555.